Julie Hagerty | WHAT A FEELING! 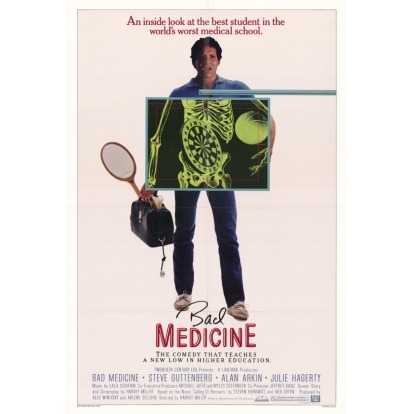 Bad Medicine is a situation comedy that relies solely on its situation to get laughs. The situation is this: A kid who can’t get into a reputable medical school buys his way into a tawdry Central American university just to get a medical degree—any medical degree. Okay, that’s a funny setup. But Bad Medicine leaves us with that and doesn’t supply any material that might have fleshed out the premise. So Guttenberg finds himself in the unnamed Central American country, where he surveys his cockroach-infested apartment with dread and nausea. But the school itself is a worse shock: a sleazy operation where students experiment on the school’s five-year-old cadaver (the only one the institution can afford, so they say). Predictably, Guttenberg finds some love interest, in the form of Julie Hagerty (Airplane, Lost in America), the spacey actress who never quite seems in touch with this particular planet. Her character’s presence actually strains credibility—if she’s as competent and intelligent as she seems to be, what’s she doing at this two-bit school? She catches the eye of both Guttenberg and the owner of the university, a moody dictator (Alan Arkin). Arkin, as he often does when he plays offbeat supporting roles, finds ways of making this character interesting. He’s a widower who wants to make Hagerty his next bride, so that she may bear him the sons his first wife was unable to give him: “I believe that God has sent you to me so that I may spawn,” he says, in the film’s funniest line. The movie ambles along, playing out tired gags. One sequence centers on a corpse-snatching escapade (the students need another cadaver, after all). Corpse-snatching is sure-fire comedy, as we all know. And writer-director Harvey Miller tries to develop a heart-warming subplot, as the students steal medicine to help a group of poor villagers whom Arkin denies assistance. It meshes with the low-comedy med-school antics about as well as you’d expect. All in all, Bad Medicine is just another space-filler as the studios wait for the Christmas movies to open. As such it can be pretty easily ignored, which is the suggestion from this corner. Steve Guttenberg and Julie Hagerty—funny, you’d think it was a can’t-miss Eighties comedy. All right, possibly not. Harvey Miller was an old school comedy guy with lots of experience in sitcoms but not much luck, it seems, in directing pictures; he got Oscar-nominated for co-writing Private Benjamin. 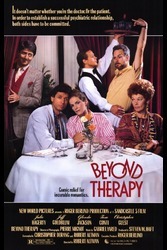 Julie Kavner and Gilbert Gottfried are in the cast, and, oddly, so is Allan Corduner, who played Sullivan in Topsy Turvy.